• LBOE's has expanded its menu. Some of the new burgers started as customer requests that then became favorites. The Tiger — Blackened seasoning, crumbled blue cheese, onion petals and Tiger sauce. 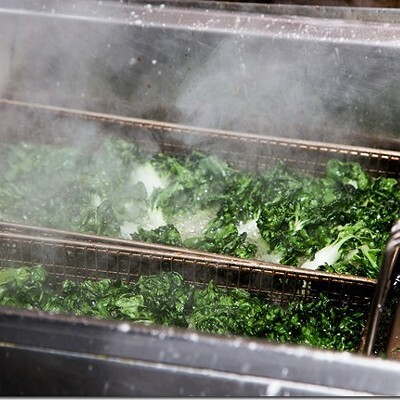 LBOE is also now offering bunless burgers served over spinach and romaine. • The season finale of the Travel Channel's Booze Traveler features Tennessee. Host Jack Maxwell unwinds a great history lesson involving George Washington, moonshine, baseball, and bluegrass. In the Memphis section, Willie Beardon drinks a Walk Me Down with Maxwell. It's a hoot! 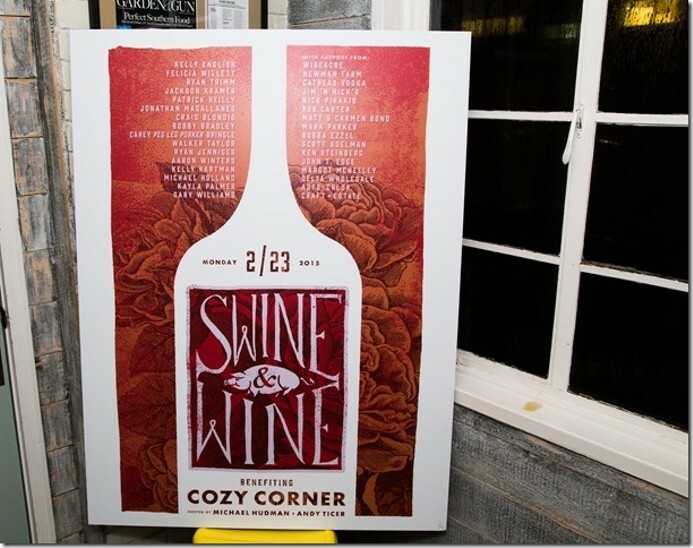 On Monday, Andrew Ticer and Michael Hudman hosted Swine & Wine, a benefit for Cozy Corner, which had a fire in January. 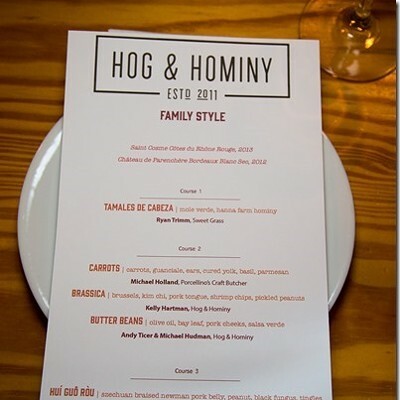 It was a progressive dinner with folks divided between Hog & Hominy and Andrew Michael Italian Kitchen and then switching places. 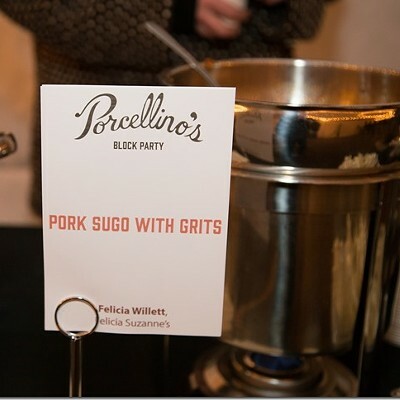 The evening culminated in a block party at Porcellino's. 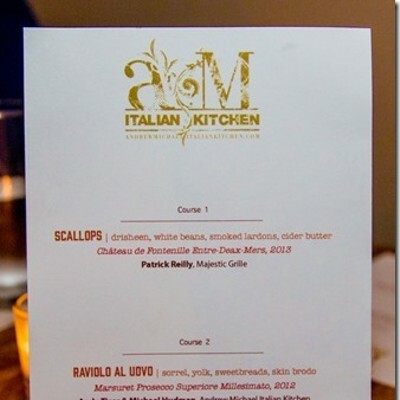 The list of participating chefs was long and impressive. Among them Felicia Willett, Kelly English, Jackson Kramer, Patrick Reilly, and Ryan Trimm. 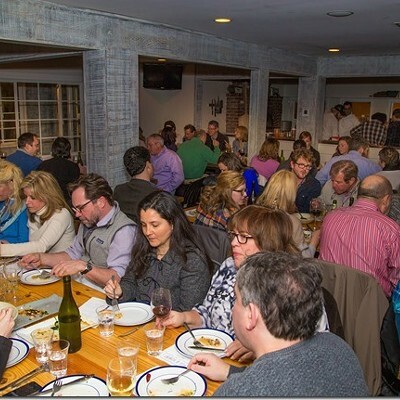 About 150 people packed the sold-out event, with some $20,000 raised for Cozy Corner. Cozy Corner is also raising funds via Go Fund Me. All photos are by Frank Chin. I had stopped by Sir Latimore Love's River Bluff Diner to take an image of this seriously awesome mural when Tommy McCoy stepped outside and cautioned me not to slip on the ice. McCoy said the mural was there when Latimore Love took over the space the week before Christmas, but the menu was completely new. McCoy suggests the Don't Bluff Burger — an upgrade of the Bluff Burger — which features two patties, pepper jack cheese, bacon, and garlic mayo. 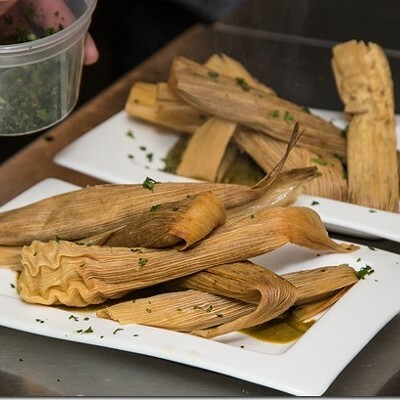 The menu also features po'boys, wings, and a healthy selection of meat and threes — from pot roast and fried pork chops to meatloaf. McCoy says that the only vegetable cooked with meat is the mac and cheese, which comes with bacon. The restaurant is open 7 a.m. to 7 p.m., Monday-Friday. McCoy mentions that the health inspector stopped by last week and has been back several times — as a customer. Answer and winner revealed in the next contest post. The answer to GWIE 58 is the Lentil & Onion burger at Belly Acres, and the winner is ... Brandon Dent! Ermyias Shiberou, owner of Stickem food truck, is planning on opening a Ethiopian restaurant on Madison near the Bar B-Q Shop in the former site of a Pizza Hut. The restaurant will be called the Blue Nile. Shiberou hopes to have it open by spring. 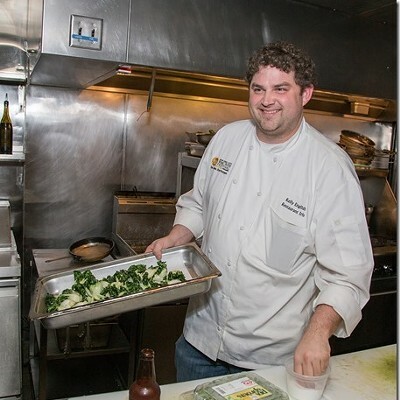 Shiberou says that he originally hoped to open an Ethiopian restaurant before he began Stickem. The reason that he's pursuing it now is that the property became available. "I felt like I've to do this now," he says. "It just makes sense to me — the timing, the location." Shiberou says he doesn't have menu set yet, but plans to serve traditional vegetarian dishes and Kitfo, which he describes as a beef tartare seasoned in clarified butter and Ethiopian spices and served with a homemade cottage cheese. He also plans to roast coffee in-house, and hold Ethiopian coffee ceremonies once a week. • For folks who are Lenting ... Whole Foods is having a Fish on Fridays special through April 2nd. Jenn Chang works three days a week at a downtown lab studying the effects of caffeine and alcohol on rats. The other days are devoted to cupcakes, specifically the cupcakes of Cake Cutie, a new online cupcake business Chang launched the third week of January. Chang, 25, is originally from California. She came to area with Teach for America. She heads to medical school in the fall and hopes Cake Cutie will provide some extra cash for expenses. "I'm not a big fan of cooking, but I like baking," says Chang. On her off days, she found herself watching a lot TV (including, yep!, Cupcake Wars), and decided to refocus her time — and that meant a lot of cupcakes. Her boyfriend (not a sweets guy) convinced her to try her hand in business. 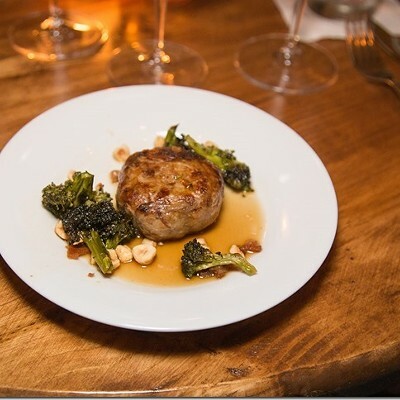 The first person to correctly ID the dish and where I'm eating wins 2 tickets to the Wild Game Dinner at the Clark Opera Memphis Center on Saturday, February 21st, 6:30 p.m. This is a really cool event, benefiting Opera Memphis. 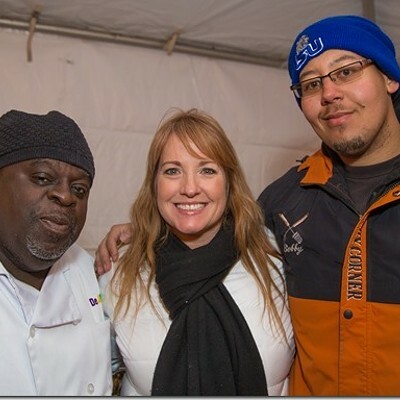 Local hunters donate game, which is then prepared by local chefs. Guests vote on their favorite dishes. There will also be an auction and wine pull. The answer to GWIE 57 is the liver and onions at the Four Way, and the winner is ... Brad Parrish! Beginning this Girl Scout cookie season, the Thin Mints sold by Memphis scouts will be vegan (free of eggs, dairy, and other animal products). For about half the country — not the half that includes Memphis — a number of Girl Scout cookies (Thin Mints, Lemonades, Thanks-a-Lots, and several others) have been labeled as vegan for several years. But beginning this Girl Scout cookie season, all Thin Mints offered throughout the country are vegan. Memphis scouts have already begun online ordering campaigns, and soon, they’ll be stationed outside Krogers and Walmarts across the city, tempting us all with their evil-yet-delicious minty, crunchy, chocolate-covered biscuits. The reason for the cookie discrepancy has to do with the fact that Girl Scouts of America uses two different companies to bake cookies for scouts across the U.S. ABC Smart Cookies switched many of their cookies over to a vegan recipe several years ago. But Little Brownie Bakers (LBB), which supplies the cookies in Memphis, is only beginning to catch on. According to the Little Brownie Bakers website, they had so many customer requests for vegan Thin Mints that they opted to start there. To make the cookies vegan, whey was removed from the ingredients, but LBB is assuring customers that its removal will not alter the flavor or texture of the cookie. Sprouts' Opening Date, Rockbone Beer, etc. • Opening date for the Sprouts Farmers Market in Lakeland has been set for May 13th, 7 a.m.
Sprouts will employ about 100. Info on jobs: sprouts.com/careers. The store's motto is "“Healthy Living for Less." • Memphis Made has announced that its new Rockbone IPA will hit the bars and stores tomorrow. • Joy Bateman will sign the latest in her "Art of Dining" series, The Art of Dining in New Orleans tonight at 6:30 p.m. at the Booksellers at Laurelwood. Of course, it was meant to be, the fried deviled egg. At South of Beale, it's included on the Snack Plate ($11), along with pimento cheese, relish, and toast points. These were better than I could have imagined— a sort of vegetarian take on the scotch egg, with a light crust and the great filling oozing out. They come atop the sweet relish, which is good, but would be really top-notch with a bit more heat. Local recently unveiled a new menu, which includes the Vegetarian Bahn Mi ($15). This one's a bear with many elements — a great baguette, savory mushroom "pate," tart pickled vegetables dressed with a fried egg and cilantro mayo. It's also a mess; you'll be using your fork by the end, because you'll want to get every bite. The answer to GWIE 56 contest is the ravioli at Ciao Bella, and the winner is ... Debra Blundell! I always like finding abandoned grocery lists or notes scribbled in the margins of used books. A couple weeks ago at Second Editions, the used bookstore at the central library, I hit the motherlode: an elaborately signed copy of the late John Willingham's World Champion Bar-B-Q. I would expect nothing less. It will sho-nuff help your bbq'n! You should choose your "beans" carefully. P.S. May Godl bless you and the republic for which we stand. God bless America! Pink Diva Cupcakery, a new vegan desserts business founded by Cassi Conyers, is holding a pop-up shop on Sunday, February 8th, 2:30-5 p.m., at Co-Motion Studio at 416 Cleveland. Among the flavors on sale: cookies and cream, strawberry shortcake, bellini, snickerdoodle, rainbow glitter, and diva delight. The rainbow glitter is a champagne cupcake with layers of yellow, pink, and blue cake with a rainbow frosting dusted with edible glitter. The diva delight is a chocolate coffee cupcake with a ganche filling with a whipped topping with a ganche drizzle. Cupcakes are $3 and the "happy hour" cupcakes (booze-filled) are $5. The answer to GWIE 55 is the cornbread/roll basket at the Cupboard, and the winner is ... Cory Prewitt!